Godaddy.com, Boost Mobile, NASCAR, ARCA, JR Motorsports, everyone now wants to be attached to the most significant female in circuit auto racing. Danica Patrick is a branding darling for many companies and organizations. In the recent weeks, concurring evenly with the NASCAR announcement, Patrick has inked another deal for last year. 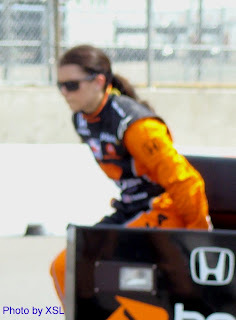 Hitting shelves of major US department stores in 2010, women can harness the scent of IndyCar star Danica Patrick. Entering into an agreement with SA Fragrances, the upcoming Danica Patrick for Her perfume is likely the first-ever fragrance to be designed by a race car driver (in North America at least) Vice president of sales has been quoted as saying in a release "Danica's fragrance will immediately be recognized as the hot new fragrance of 2010". Scheduled to be priced between $30-60 for sprays ranging from 1 ounce to 3.4 ounces, Danica Patrick for Her perfume is targeted against other products promoted with the likes of Britney Spears and Paris Hilton. While promoting their scents, SA Fragrances of Boston are also setting a track record for spotlighting strong, positive female influences. Recently the Boston, Massachusetts fragrance company launched Annika, a perfume on the brand of golfer Annika Sorenstam. Don't expect the perfume to smell like motor oil or 20 lap-old tires at Indy; For some reason, those aromas have yet to attract favourable attention from perfume creators.